Use fly baits and other methods to control existing adult flies. Cyromazine is not an organophosphate, and has been safely used in horses since 2001. Made with an alfalfa base. 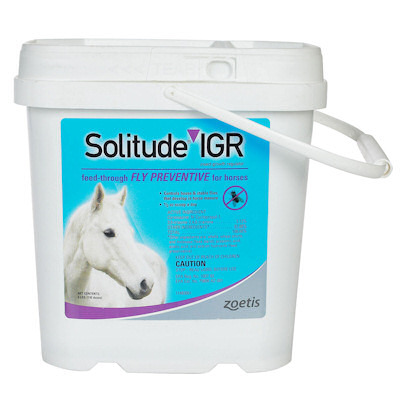 Solitude IGR is top-dressed onto your horse's feed. Dosing is simple, feed one scoop (1/2 oz.) per day, no matter what size or age of your horse. Scoop enclosed. Pellets. Unlike Equitrol - This supplement is extremely safe, can even be fed to pregnant and nursing mares.